1.Opaque paint for accurate model building. 2.Environment freindly with an option of exhaust connection. 4.Motorised rotary stage for uniform paint. We are leading manufacturer & Supplier, offering Air Brush Unit to our clients. We are offering Air Brush Gun. 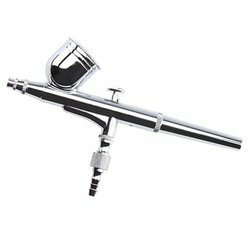 With its impeccable performance, user friendly nature, high precision, superior strength and longer functional life, the offered Air Brush Gun is known to be amongst the finest options available in the market. Manufacturing of this range is done as per the set industry norms and guidelines, it has its quality highly maintained.